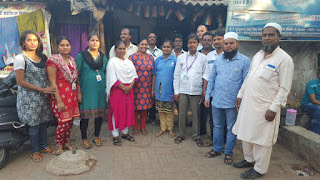 17-Jan-2018, Mumbai: The Don Bosco Development Society (DBDS) organized a free Hepatitis - B vaccination camp for the residents of Antop Hill slum in Mumbai in which more than 250 people benefited. The camp was held under the aegis of project supported by Don Bosco Mondo, Germany. This vaccination camp was organized in association with AMERICARES. Ms. Surekha Pednekar (Coordinator- DBDS) & Ms. Basanti Solanki (Staff-DBDS) inaugurated the camp. The camp was held in the office premises of Maharashtra Islamic Society. Ms. Surekha welcomed the office bearers of Maharashtra Islamic society and thanked them for their contribution to this camp. She also thanked Dr. Devyesh Devaliya and his team for their support to this camp. Hepatitis B is an infectious disease caused by the hepatitis B virus (HBV) which affects the liver. It can cause chronic liver disease and puts people at high risk of death from liver cirrhosis or cancer. Its vaccine is very costly but it was given free of cost to the poor people from the slum. Large number of women, men and youth got themselves vaccinated in the camp. This will be followed by 2 more vaccine shots in future as the course comprises of 3 shots of vaccine at different intervals.